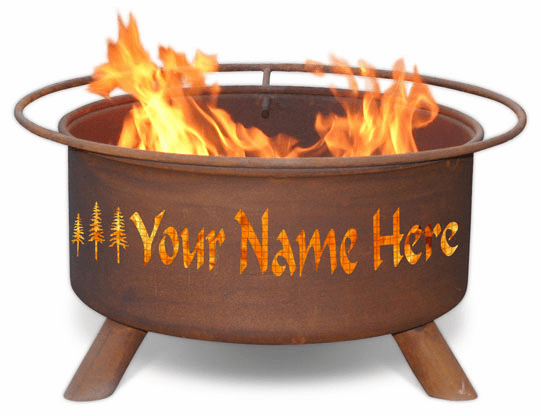 Fire Rings - Camping Fire Ring - Patio Fire Pit. Our unique line of fire pits are made from the highest quality drawn cold rolled steel and finished with a natural rust patina that ages beautifully over time. Manufactured by Patina Products, these fire pits are supported by three strurdy legs, welded in place to prevent the pit from wobbling or tipping. 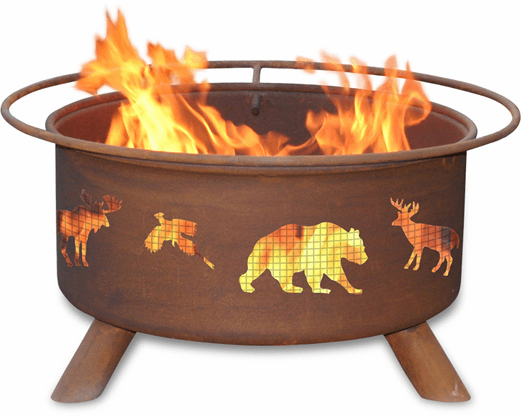 Every fire pit comes with a poker, barbeque grill, spark screen and weather cover, as seen in the picture above. 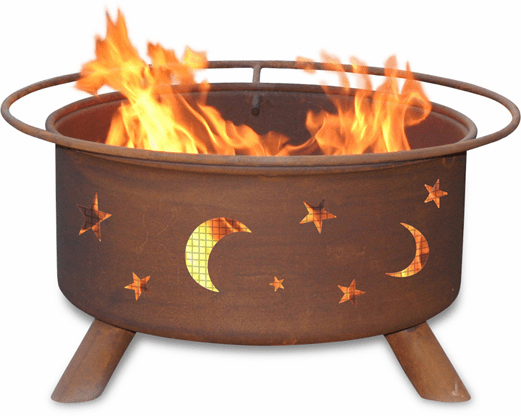 The natural rust patina fire pit comes fully assembled and has a 5-year warranty on the fire pit. You see that each fire pit has a safety ring surrounding the pit that also functions as a footrest or handle. 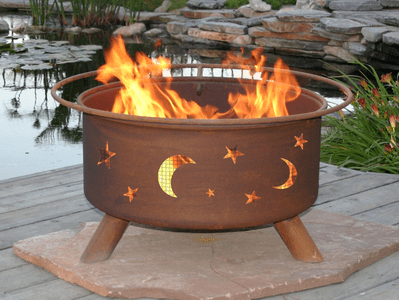 A steel mesh is welded into the inside of the fire pit to reduce sparks or coals from escaping through the cut-out designs. Each fire pit measures 16" tall and 24" round. The outer ring around the top measures 30" round and weighs 50 lbs. 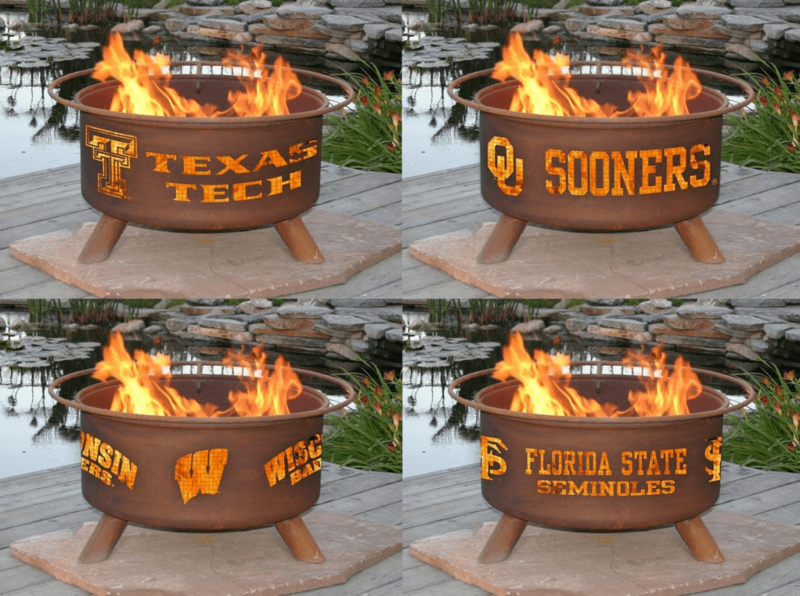 Our fire pits are great for the deck or patio and are convenient to take to the beach or local tailgate party. Choose from a variety of wildlife, regional and scenic designs.